Although Cancun is the gateway to the Yucatan peninsula’s coastal resorts, since the late 90s, many families have chosen to bypass this exciting city and spend their holiday time south along the Riviera Maya. Boasting more than 40,000 recently built rooms at large resorts, most of the Riviera Maya properties are foreign-owned, beachfront all-inclusives with nary a sign of Cancun’s glittering nightlife. Having said that, I would urge anyone of any age within 150 miles of Cancun to gladly give up a day of their prepaid buffet and windsurfing class to spend time at one or all of the fascinating nature preserves and marine parks outside the city. Here are some suggestions for fun at Mexican destinations near Cancún: Isla Mujeres, Cozumel, Xcaret, and the Riviera Maya. Boarding the ferry from Cancun for the scenic 45-minute ride across the Bahia de Mujeres to Isla Mujeres is like leaving one laid back world to enter another. The land of the eternal mañana is an island whose hippie supporters have kept development to a minimum and the pace to a crawl. There are also high-speed ferries that make the crossing in 15 minutes. Most daytrippers go to see the Garrafón Reef Park and the ecological attractions of a reef system under restoration. With the basic nominal admission fee, families can tour an outdoor sculpture garden on the islands’ south point, a small Mayan temple to the goddess Iixchel, a small museum, laze in hammocks under leafy palms and try several seaview restaurants. The free snorkeling area next to the coral reef is the most popular place for the visiting Mexican families, due to the park’s notoriety for hosting many exotic fish during the years it was a national park. Alas, when the management of Xcaret took it over a few years ago, its 26 acres were restored and the popular reef was closed to the public in order to regenerate the damaged ecosystem. Foreign visitors are more likely to notice the Snuba and Sea Trek areas, roped-off sections of the undersea world where, for a fee, guests can train for — and try out — these new sightseeing technologies. Snuba, a modified scuba program for children ages 8 years and up, allows first-timers and the curious, tethered to a group air tank, to don a mask, fins, bodyweights and snorkel equipment for a dive of about 20-feet-deep. Up to eight guests per session follow a guide down to the sea floor to look at the coral, colorful fish and other items, such as a sea cucumber and starfish, that are presented. Although I didn’t enjoy the responsibility of having so much scuba equipment to deal with, snuba presents children with a very accurate and exciting diving experience. This is an hour long program. Alternatively, SeaTrek is an undersea exploration system where participants don a head and shoulders unit fitted with an air hose. As the noisy regulator pumps a steady flow of pressurized air into the helmet, the sea water is kept out, enabling guests to walk the submarine surface with the aid of a handrail. Using hand signals, the guide motions the group of five to stop while he feeds the neighboring fish, creating a cloud of Sergeant majors, Rainbow fish, Grouper, and others in vivid hues of blue, yellow, sparkling silver and purple. The proximity of so many fish, the 45-minute session of weightlessness, the magnification provided by the globe helmet and the few marinelife creatures the guide places in your hand contribute to making this a very moving – if disorienting –experience. Book your session when you first arrive at the park to avoid disappointment. Located in the waters off Isla Mujeres, the Cancun Underwater Museum is not exactly a marine park — it’s a sub-marine sculpture park that is constantly expanding. Snorkelers and scuba divers can admire the 60 recent sculptures added by artist Jason de Caires Taylor to bring the total number of his works to 400. With everything from life-size human sculptures, many of which were caste from Cancun locals, to a full VW Beetle that was especially designed to encourage lobsters to make their homes inside the vehicle, each statute is made with materials that are safe for marinelife and encourage the formation of an artificial reef. Cozumel is another popular island, about 45 minutes south of Cancún, and about 45 minutes east by hydrofoil. If you’re interested in seeing more than the touristy port of San Miguel, plan a daytrip to the Parque Chankanaab (Xancanaab), where Dolphin Discovery has a dolphin encounter facility and a small lagoon for snorkeling and beginner scuba lessons. Other local Cozumel attractions include the lighthouse at Punta Celerain and the minimal Mayan ruins at San Gervasio. To reach Cozumel, you can join an organized bus tour from Cancún or take a bus south, hop on the ferry and hail a taxi for sightseeing. When I heard that 70% of all visitors to Cancun make their way to Xcaret (52/998/883-3143 and pronounced ICH-kar-ette), I thought why isn’t this 99%? This “ecological theme park,” as it’s so confusingly known, is one of the world’s most exotic attractions and deserves to be widely seen. A remarkable parcel of 200 acres of land north of Tulum has been hand-sculpted to show off its natural beauty to its best advantage. Since 1990, Xcaret’s Underground River system has been its claim to fame. The region’s typical underground sweet water rivers, originally used by the native Mayan Indians for stealth warfare, have had their coral and limestone ceilings chiseled a little higher and a little wider to allow for the safe passage of those swimming along the natural “lazy river” current. These unique freshwater streams course through a limestone and coral tunnel that narrowed or became more spacious as nature intended. The original river journey has been augmented by the Mayan River, discovered through another freshwater cenote (sinkhole) on the park’s property as well as the Blue River and the Manatee River. The Mayan River flows at the foot of steep limestone walls that allow floating swimmers or snorkelers to view birds, tiny crabs and the flora of the cliff walls. The Mayan River may be better suited for younger children, who between the ages of 3-5 are sometimes frightened by the constant semi-darkness of the Underground River, and it’s a less confining choice for the claustrophobic. However, the Mayan River has less natural current than the other, forcing you to occasionally dog-paddle and making your journey somewhat more tiring. Anoter of Xcaret’s rivers, the Paradise River, was opened in 2004 to accommodate non-swimmers and can be toured on a small guided raft. It flows quietly through a botanical garden, mushroom farm, and aquaculture zone for raising tilapia (a popular local fish) and is a tranquil spot when you want to avoid the up to 6,000 guests who arrive daily in the busy winter holiday season. Be prepared to walk – Xcaret is huge! Bring a stroller for the little ones, a hat, water and comfortable shoes. In addition to the costumed dancers who entertain at the lunch buffets, Xcaret puts on a wonderful cultural show each evening in the summer at 7pm and in the winter at 6pm. Their full size arena offers stadium seating on three sides, and one wall of bleachers with tables, where viewers who pay a premium can enjoy really a excellent meal while watching the show. It’s quite an extravaganza, beginning with a game of pelota, the Mayan’s legendary form of soccer using flaming balls, to a cast of more than 300 costumed performes singing classic tunes or performing folk dances from around country. I suppose if you won’t ever venture farther from your all-inclusive resort than this, it’s an excellent cultural immersion into the great country of Mexico. Roads leading south to the Mayan archaeological sites of Tulum or west to the pyramids of Chichen Itzá cross lowland tropical forests and mangrove swamps. Once overrun with monkeys, crocodiles, jaguars, aardvarks, exotic birds and other wildlife, today’s jungle boasts two lane blacktops, small villages, and coconut plantations. You’ll pass endless Mayan-inspired plinths marking the long, winding driveways of all-inclusive resorts and golf courses. The region’s temperate climate still supports a thriving habitat inland and, if you hire a local guide to hike, or visit a fenced-in wildlife attraction, you’ll be delighted by how much there is to see. Despite the bustle, sea turtles still hatch on these beaches between July and September, and three eco-parks — Xpu-Ha, Tres Rios, and Actun Chen. 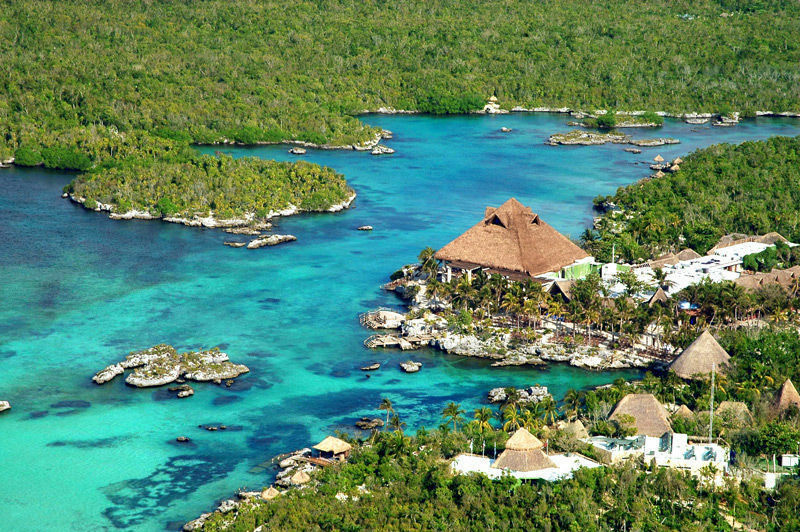 Another in the Grupo Xcaret pantheon of successful eco-parks, this national park turned privately preserved eco-attraction boasts the commercial savvy and pristine environment of Xcaret and Garrafon, without the crowds. Creeks, lagoons, natural caves and other waterways boast a surprisingly varied collection of sea life. Their spring-fed river has enough current to fool even the kids into thinking it’s a lazy river ride. This is Xcaret Lite and a great alternative for the true nature seeker. You can visit Xel-Há’s (52/998-884-7165) collection of tropical birds, tour a spring-fed underground river cave or cenote or, at certain times of year, see where sea turtles are making their nests and laying eggs in the sand. We also appreciated the roving Mariachis and other Mayan musical performers, as well as the naturalist with a huge iguana on his shoulder, who mingle with the crowd and remind guests they are in Mexico. Swimming with the dolphins programs require an additional fee and should be booked in advance. Quite a fun, educational and different day at the beach than what you’d experience in your hotel. The Si’an Ka’an Biosphere in the southern part of the Yucatan peninsula is the region’s largest nature preserve, with over one million acres under government protection. Having said that, travelers should be aware that development pressures along the Riviera Maya are fast extending south, making the “entrance” and surrounding areas of Si’an Ka’an the target of real estate developers and hotel chains from around the world. Si’an Ka’an has been declared a part of UNESCO’s Man and the Biosphere Program, becoming a UNESCO World Heritage Site for its unique geography, wetlands, 23 known archeological sites (with relics dating up to 2,300 years including some from the Cohuah and Uaymil native cultures), flora and fauna. Families will find this still-rustic region is most easily toured with the help of local guides; many tour operators offer daytrips including sightseeing by boat, a mangrove swamp tour and some opportunities for swimming. Families with teens may be interested in the offerings of Alltournative Tours(800/507-10992), a Cancun-based tour operator with a selection of active daytrips. Fit family members can rappel inside a cave, tour the ruins of Coba, fly across sink-holes “Tarzan” style, and partake in a jungle canoe adventure. For families interested in a fishing or diving adventure, the Akumal Dive Shop (52/984-875-9032) is well regarded.